'The Paston Treasure' flaunts a family's wealth while meditating on death. 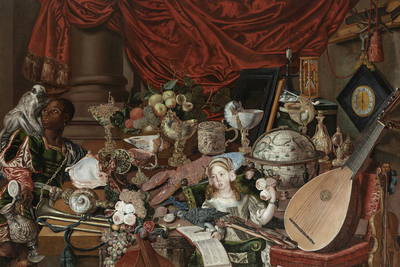 To borrow from Winston Churchill, "The Paston Treasure" is a puzzling peculiarity, enveloped in mystery. Measuring 8 feet by 5.4 feet, the painting (c. 1663) transports the viewer to the luxurious 17th-century milieu of the land-owning Paston family of Norfolk, England. Beautifully painted, with many precise details, it asserts the Pastons' wealth and prominence near their zenith, before the English Civil War and too-lavish spending took them down a peg. It looks like an overstuffed jumble, replete with vessels, timepieces, musical instruments, animals, fruits, flowers and more, gathered from the West Indies, Southeast Asia, the South Pacific, Africa and the Americas, as well as Europe. But all these possessions—which would have been on display at the Pastons' seat, Oxnead Hall, or kept in a locked cabinet of curiosities known as the "best closet"—represent a "microcosm of the known world." That is the subtitle of the special exhibition anchored by the painting at the Yale Center for British Art in New Haven, Conn. Detail: Perfume flask, among other items. The painting is a unique combination of still life, ostentatious banquet painting, allegory of the senses and continents, portraiture, animal painting and—most of all—the vanitas genre. Beneath the bounty is a message: That drooping flower, the ripe fruit, the candle stub convey the fragility of life and inevitability of death. Other objects allude to the fleeting nature of fortune, which for the Pastons was peaking as the work was commissioned. From what artist and by whom? Those are two of the painting's mysteries. The artist, who scholars believe was an itinerant Dutchman, is unknown. He may have been hired by Sir William Paston (1610-1663), a globe-trotter of his day who added significantly to the family's extensive collections, which were begun by the mid-1500s, or by his eldest son, Sir Robert Paston (1631-1683). The painting may have been started during Sir William's lifetime but completed later—which may explain why the upper right corner was repainted twice. At first, a silver platter filled the space, but it was replaced—perhaps because ownership of the plate was contested—by a woman. Scholars conjecture that she may have been Sir William's second wife, not Sir Robert's mother. She's gone, too, the space filled with a clock and antlers, possibly by a second, less-skilled artist. The artist moored the painting with 13 vessels that stretch across the picture—the "stars" of the work, in the words of Yale curator Nathan Flis, who co-organized the exhibition with Andrew Moore, former keeper of art and senior curator at Norwich Castle Museum and Art Gallery, which owns the painting. 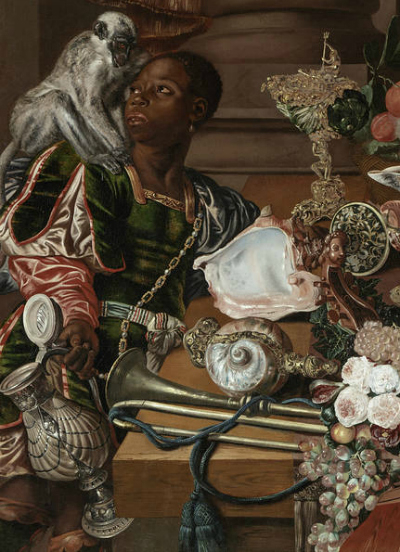 From the left, the first two—a silver-gilt flagon decorated with dolphins and shells and a pearly strombus shell cup mounted on a niello enamel base—are held in place by an exotically dressed servant, who is distracted by the African monkey on his shoulder. Are the two vessels—the first tilted, the second tipped over on its side—meant to show the precariousness of life, to sate the viewer's curiosity about what's inside, or to show, in the case of the strombus shell, a vessel devoid of the life it once sheltered? Probably all three. Another striking feature of "The Paston Treasure" are the artist's echoes. For example, the musical score held by a girl (probably a favored child) is identified in the exhibition catalog as part of a piece in which a supplicant requests passage over the river Styx, emphasizing the painting's focus on the passage of time. Across the picture, on the base of a nautilus cup, a satyr holds a musical composition that is also about death. Scholars believe that these selections, these placements were completely deliberate, which raises another question. The Pastons owned hundreds of objects; 11 existing inventories catalog jewelry, paintings, pietra dura objects, globes, tapestries, deer antlers, miniatures, books, musical scores, crocodiles—the list goes on. Why these? There are only hints. Many objects have a nautical connection, possibly a link to Clement Paston (1515/23-1598), a sea captain who was one of the family's early collectors. Or perhaps, in tune with the vanitas theme, they cite the dangers of the sea—or the possibilities of journeys in an age of curiosity and scientific discovery. Exquisite yet strange, "The Paston Treasure" has many more secrets to be revealed.